- Downside is higher power budget and full power even if 1 user. The Doppler on the 10m band is about 15 times less than on 70 cm and changes at a rate between about 1 to 5 Hz per second. The following table is a worst case (350 km orbit) and it shows the rate of change of Doppler for typical passes below the peak elevations shown. So 2/3rds of the time the Doppler rate of change is in the range of about 3 Hz per second or less. It looks like 90% of the time it is 5 Hz or less. And worst case is 16 Hz change per second. Peter G3PLX is working on a second order AFC tracking loop to keep up with this dynamic rate of change. But it will be better if all users correct their Doppler in their uplink instead of the downlink. Notice also that for LEO spacecraft the Doppler rate of change is always downward. For AO-40 in an elliptical orbit, however, the rate of change can be either direction depending on whether the satellite is accelerating towards you coming in from Apogee, or slowing down as it goes outward from Perogee. Because the software will be working FULL DUPLEX so that it can listen to its own Doppler shifted uplink in the downlink to run its AFC, this means that the user will typically operate KEY DOWN on 10m the whole 8 minute pass. But while he is transmitting, he will be SEEING everyone else on the band. Thus this will be a new mode of PSK-31 operations, kind of like a chat room full of people with everyone seeing what everyone is saying in real time and being able to KEYBOARD to them all as fast as one can type. Each pass will all be over in 8 minutes or less, though. The ideal downlink band is on 2 meters where the Doppler is less than +/- 3 KHz so no FM downlink tuning is necessary if the deviation on the transmitter remains below about 3 KHz deviation. But if the 70 cm Amateur Satellite Downlink is required, then the operator will have to change the frequency of his UHF FM receiver 3 or 4 times a pass to keep up with the +/- 9 KHz of total FM carrier Doppler on the downlink. To the right you can see a typical passband showing about 10 stations. Everyone sees the same spectrum and adjusts their uplink to keep their signal where they choose. One of the biggest problems with linear transponders is power sharing of power in the linear passband. This results in the strongest signal getting most of the power at the expense of the other operators. This is compounded when the AGC reduces the overall passband gain to prevent the strongest signal from overloading the system, which results in everyone losing power. Another unique aspect of this transponder is that it will be the first amateur satellite to use 10 meters as the uplink band. As noted above, all of the advantages of this PSK-31 low-doppler and balanced passband design depend on the use of 10m as the uplink band. Unfortunately, the ARRL (and probably other countries) band plans suggest only 29.300 to 29.510 for “Satellite Downlinks”. This apparent limitation of 10m for only downlinks is only a legacy of the early Mode A satellites and is not part of the FCC nor the ITU rules. The entire 10m band is legal from that perspective. 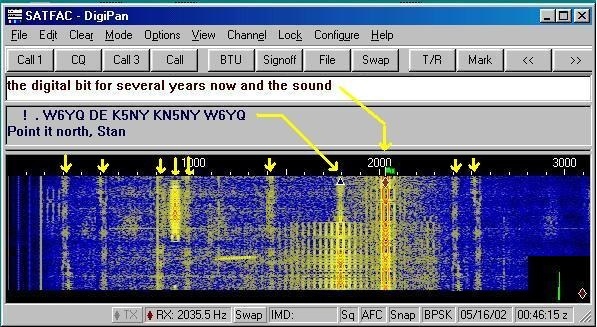 A second issue is that only the 28.1 to 28.3 MHz sub band is authorized for Novice and Tech-Plus licensees in the USA. Therefore, we originally proposed that this PSK-31 Satellite UPLINK be a 3 KHz wide spectrum somewhere in the 28.1 to 28.3 MHz CW/Digital sub-band not only so that Novice and Tech-Plus operators may use it, but also, to prevent the obvious temptation for an SSB user to saturate the entire passband with his single Voice QSO. Currently PSK-31 QSO’s on the 10m band congregate near 28.120 and a Transceiver Kit crystal controlled on that frequency is readily available from Small Wonder Labs making this an easy satellite for students to access.